We made the front page of the local newspaper today with the seasonal issue of magpie attacks associated with our display. At our community event at Royal Park in Buninyong on Saturday 6th October, the local magpies clearly identified our birds as potential threats to their nesting sites. Both Skeksi and Yarrum were dive-bombed by a particularly brave magpie. We had to finish up early as a result as Yarrum became too distracted by the incessant close encounters and Martin also needed to make sure he wasn’t going to incur any injuries. Click here to read the article. Leigh Valley Hawk & Owl Sanctuary has paired up with aerospace engineers at RMIT to investigate how birds maintain stability whilst hovering. 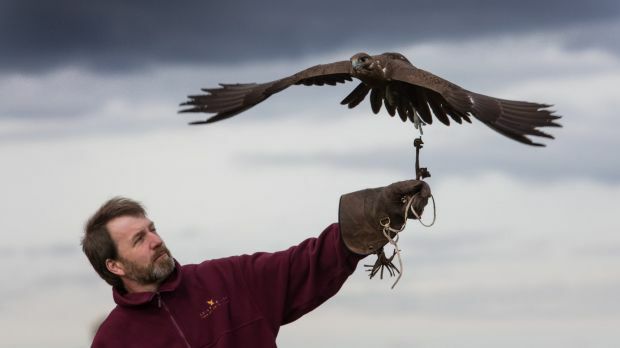 Kevy and Jedda, our two Nankeen Kestrels, have been involved in this study, demonstrating their natural behaviour to hover but in an artificial environment: a wind tunnel. The purpose of this study is to investigate gust mitigation for micro air vehicles and drones. This article outlines more information about our kestrels’ involvement and the study itself, including a video of Jedda demonstrating her hovering technique. Click here to read the article. Unfortunately, we had to make the most difficult decision in 2018, which was to cease raptor rehabilitation. This aspect of our work has always been challenging and often heart rending as the outcome of many injured birds of prey is euthanasia. The reality of looking after twelve of our own birds, which entails daily training, needed to become our priority and we found we could not perform both effectively any longer. This article from our local paper explains in more detail our rationale for this decision. Click here to read the article. Junior, one of the last birds Martin successfully rehabilitated back into the wild in 2017. The young journalist, Alex Mullarky, has beautifully captured the essence of what we do in this article for the online magazine, Wild Melbourne. Not only does Alex describe the rehabilitation work that encompasses so much of our time, but also our philosophy and how it informs our educational displays and the work we do overall. Click here for the full article. Soon after the publication of The Age article (see below), we were contacted by The Weekly Times, who were interested in finding out more about the Sanctuary’s work. 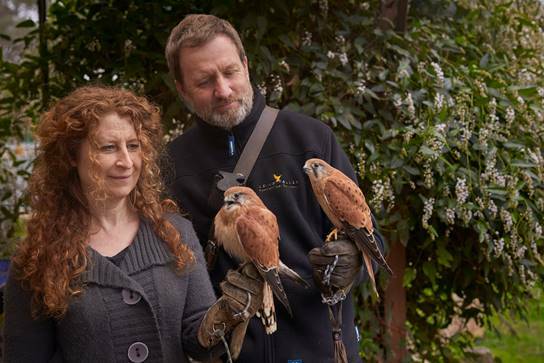 This article is a lovely summary of Martin’s connection with the birds and the rehabilitation side to the Sanctuary. The photographer and journalist spent quite some time ensuring that Martin smiled in the photos as you can see below. Quil was determined not to comply…but she looks gorgeous regardless. Click here for the full article. We were contacted in July by a journalist, who was keen to write a piece on the work we do. Fortunately, the timing was perfect as Martin was just about to release a female Black Falcon back into the wild. So, the journalist, a photographer, camera-person, and David Whelan – our photographer friend – all came along to witness one of Martin’s ‘successes’ return home. Click here for the full article. 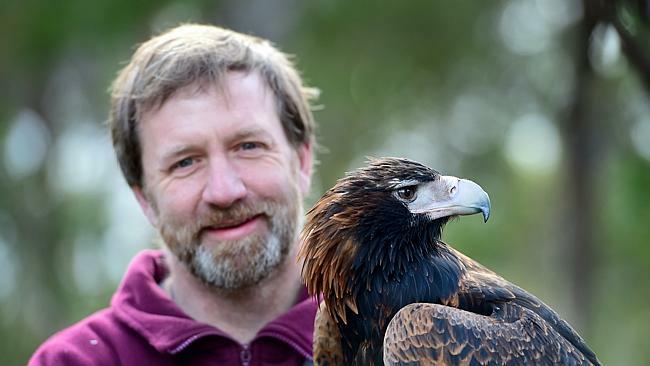 Martin, Kevy and MinMin will be busy at the Ballarat Wildlife Park during the Easter weekend and school holidays as outlined in the article that appeared on the front page of our local newspaper, The Ballarat Courier, on Thursday 26th March.